There is nothing more refreshing on a hot summer day than cooling off in a beautiful swimming pool, but it can be just as relaxing in the winter! 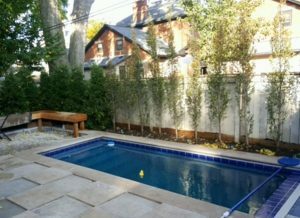 For many homeowners, a swimming pool and spa are an important part of their year ‘round outdoor entertaining plans. 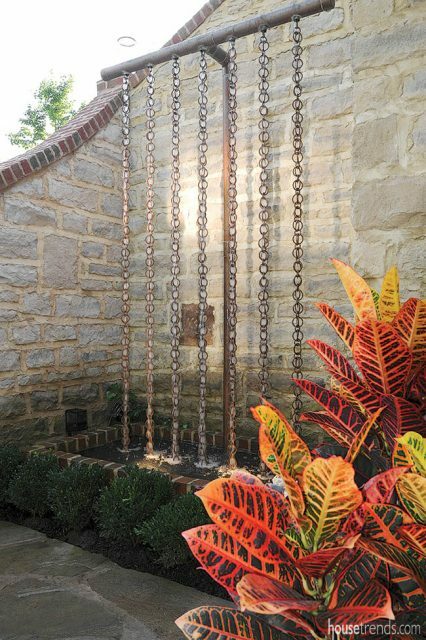 Creating a custom pool and spa worthy of discerning clients requires both design creativity and building expertise. Landfare Ltd. brings both to every project. 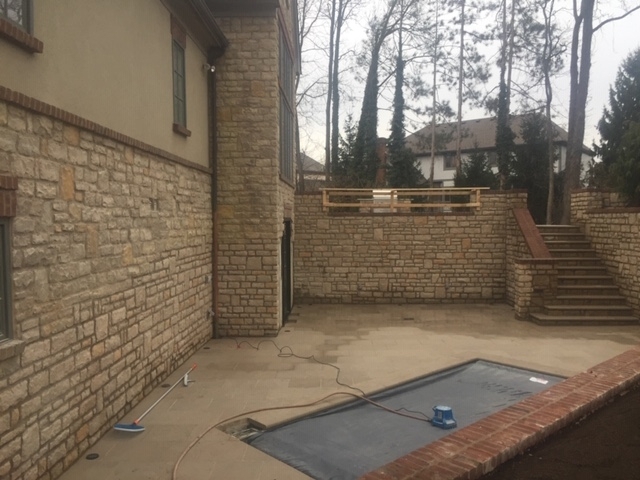 While there are many ways to consider a pool project, Landfare Ltd. has a very specific approach to ensure that all outdoor living spaces are designed to enhance the home’s architecture and provide the functionality homeowners want. 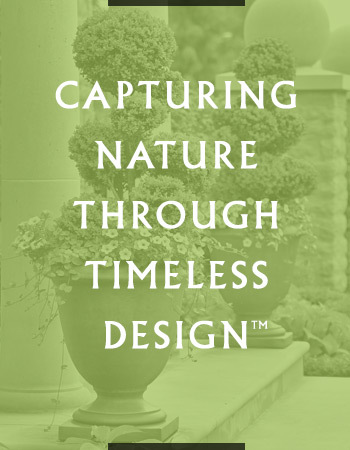 All Landfare Ltd. designs reflect the company motto: Capturing Nature Through Timeless Design™. Before construction begins, we meet with our clients to discuss their vision and dream list. Together we determine how they will most often use the pool, spa and surrounding areas: sports activities (like pool volleyball), leisure activities or active swimming and diving. These, along with space allocation and budget, help guide our design recommendations. Long-lasting and vibrant landscape design requires trees, shrubs and plants that not only work well together but can thrive in our climate. 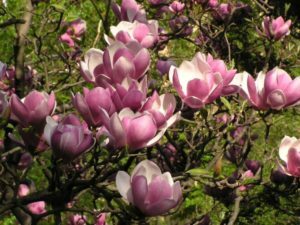 Some of our favorite ornamental trees are in the magnolia family. Generally, they bloom in the spring and create a torrent of color – a very welcome sight after a midwest winter. The blooms are white or pink and though they look delicate, they are very hardy. Saucer magnolia is quite common and always a great selection. 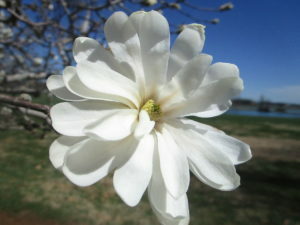 The flowers on the star magnolia are white and they do look like stars! When selecting any tree, it’s critical to consider its location – the growth both in height and width impact overall landscape design. 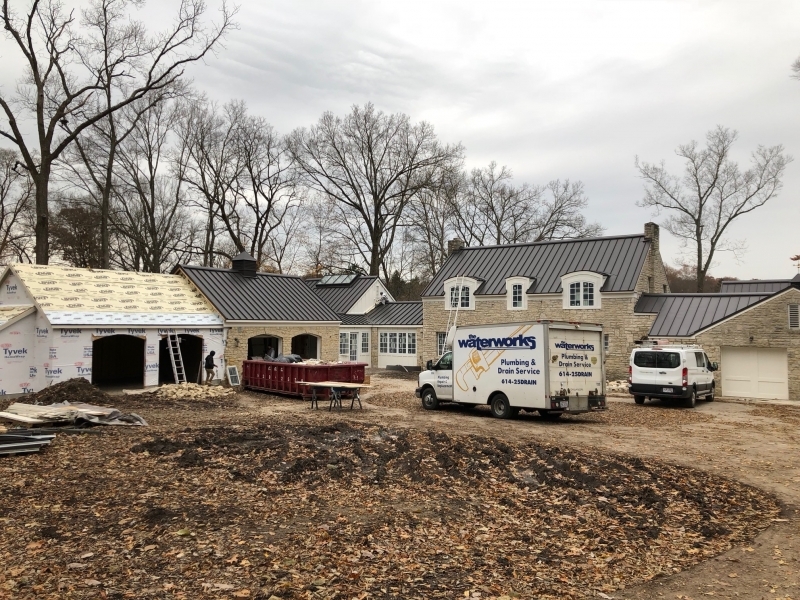 No matter the weather, we continue working on our projects. Our Landfare Ltd. team is ready for anything! 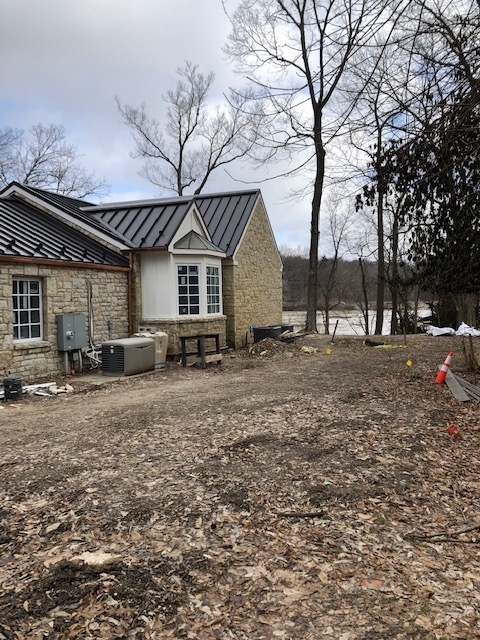 The exterior renovation of this river front home is moving forward, with stonework nearly complete. We like documenting before and during photos so you can see where we started and the ultimate, beautiful outcome. 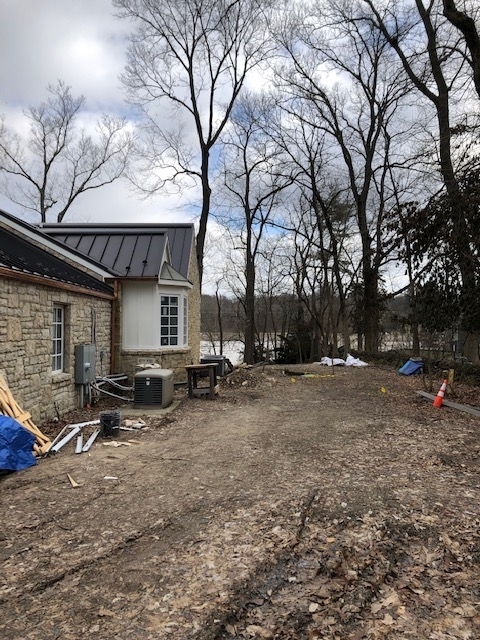 Can’t wait for our landscape design to be installed. It will be amazing! This ornamental tree is popular in Central Ohio because it blooms white, pink or red flowers in the spring – always a welcome sight after a cold winter. In fall, their scarlet berries attract robins, bluebirds, thrushes, cardinals and many other species of bird. These medium sized trees have beautiful spring blossoms but it is their fall fruits that are winter-persistent that make birds sing! There are several varieties available, with some bearing fruit as small as 1/4″ round, which makes the easy for robins, bluebirds, cardinals, finches and other birds to easily eat. 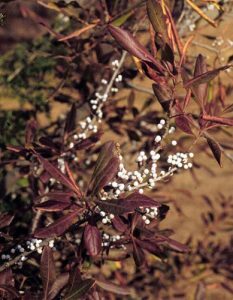 A semi-evergreen shrub, the Northern Bayberry is known for its fragrant, waxy, silver-gray berries that stay on the shrub throughout the year. Tree swallows and bluebirds love the fruit and often will nest in the shrub. 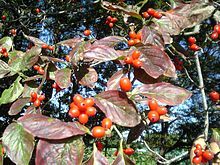 This shrub is most beautiful in the fall when it shows brilliant red foliage. That’s also when its winter persistent fruit ripens, attracting robins, bluebirds, cardinals, chickadees and starlings. Unless you have a very large lot where trees can be planted far from your entertaining and service areas, we do suggest avoid planting any Mulberry trees. While they are lovely and birds certainly do enjoy their summer fruit, they among the messier trees, with berries staining whatever they fall on. Creating a landscape sanctuary for you and native birds is part of the process we work through at Landfare Ltd. 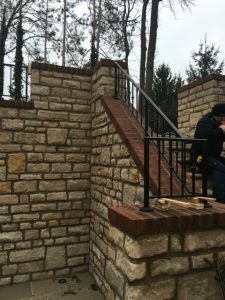 Custom built wrought iron railing is being installed at our client’s terraced outdoor living space. 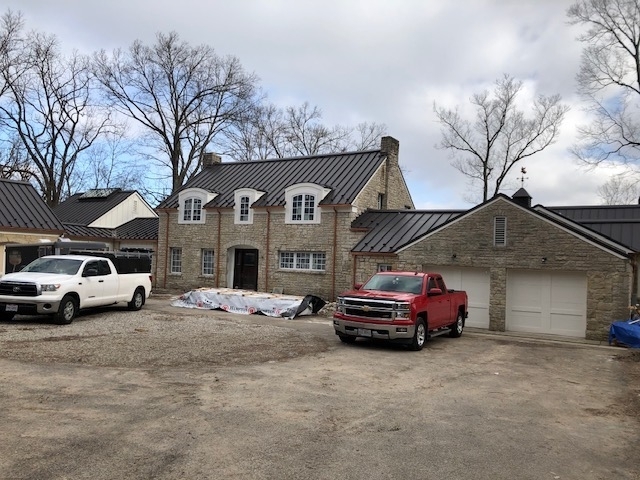 Landfare Ltd. created a total redesign of their property. 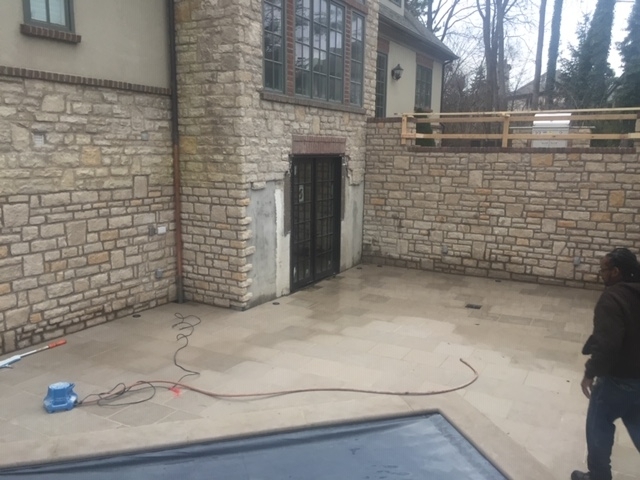 The lower terrace did not exist until we excavated about six feet of dirt to create a whole new entertaining space, including a pool! 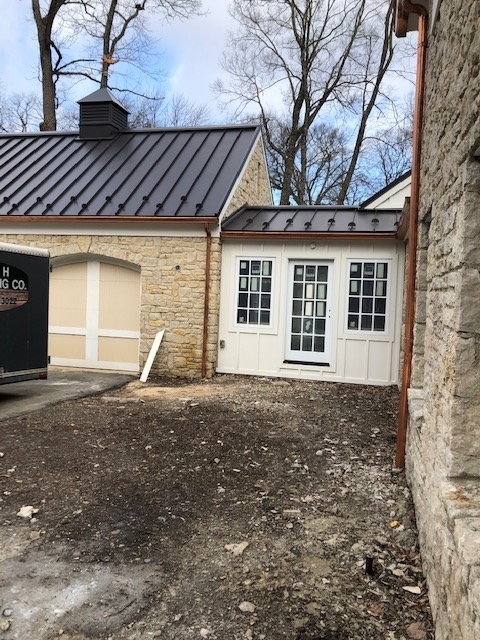 If you look at the window you can see how we incorporated the existing brick into our design. That’s what we mean by Capturing Nature Through ™. 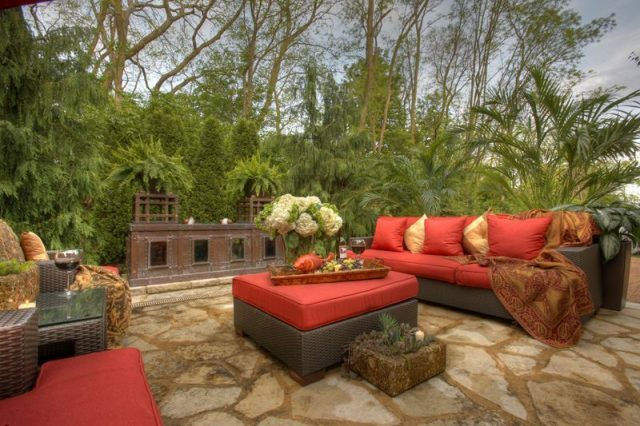 When a client asks us to re-imagine their outdoor entertaining spaces, we dig deep and create something out of nothing. 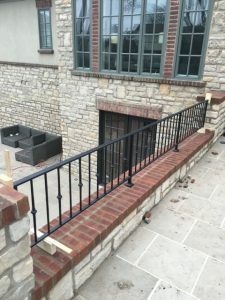 For this space, we dug six feet below the existing ground level, created a terrace, installed a swimming pool, replaced the existing window with French doors, matched the home’s limestone brickwork, built a surrounding limestone walls for privacy and built a stairway from the new upper terrace to the lower terrace. 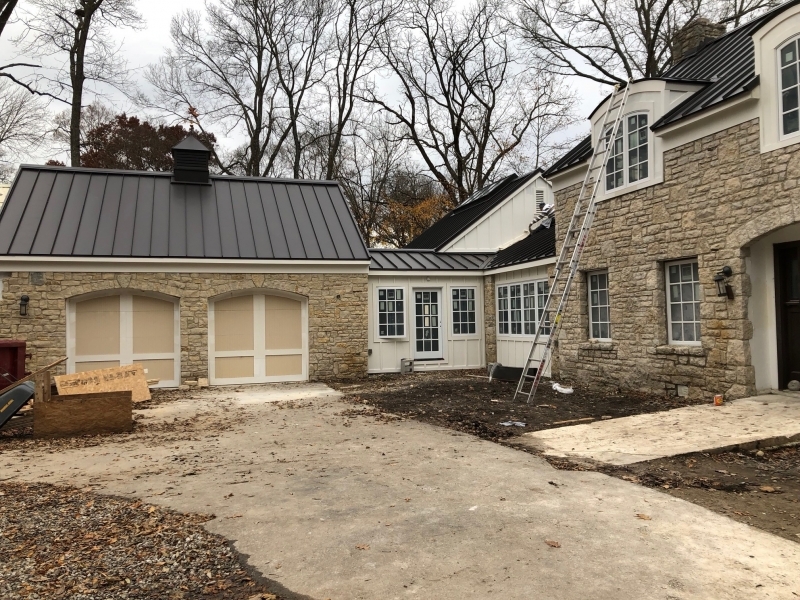 Landscaping is in progress and custom designed and fabricated wrought iron railings are in production. That is definitely a space re-imagined! 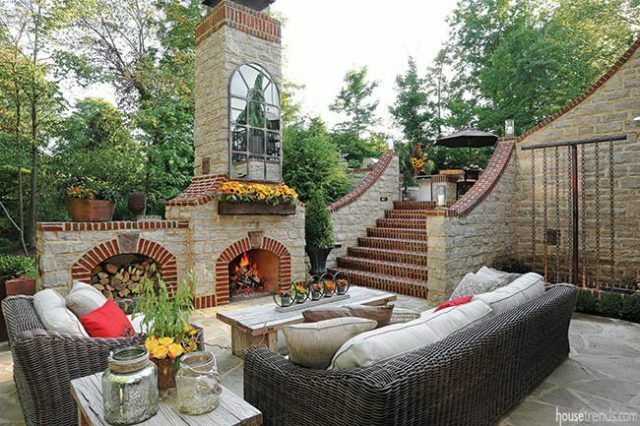 Landfare Ltd. has a definite vision for the outdoor living spaces we design and build for our clients. Our designs are based on a deep understanding of what each client is looking for, their lifestyle and how they want to use their spaces. And our work must always enhance the client’s home and improve how they enjoy their home. 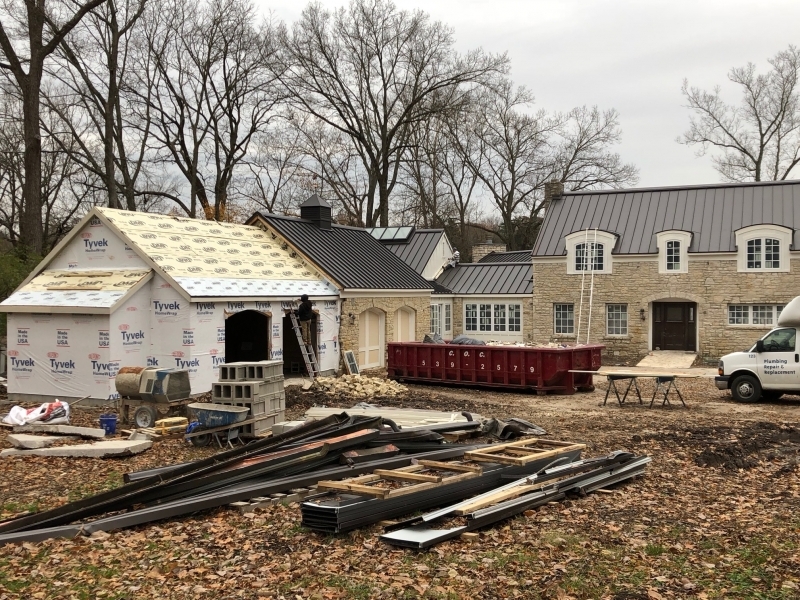 All the elements we incorporate – water features, pools, spas, landscape – all work together to project the pride our clients have for their homes. 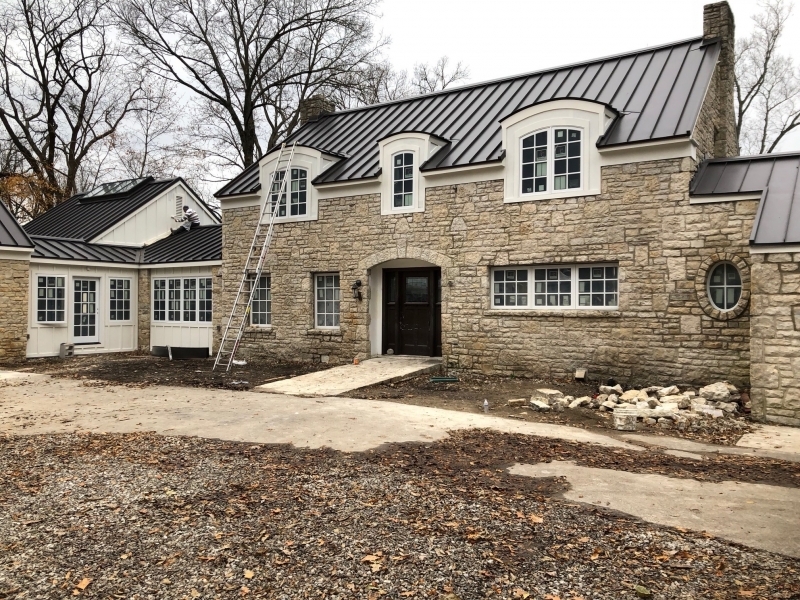 We never create trendy or ostentatious designs that conflict with the home’s architecture and property. 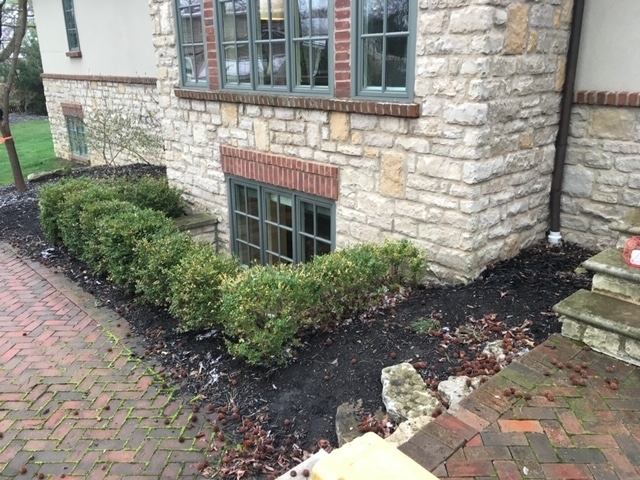 While working on installing the landscape design plan on this property, the team at Landfare Ltd. discovered a 1950s era planter that the homeowner had forgotten about. 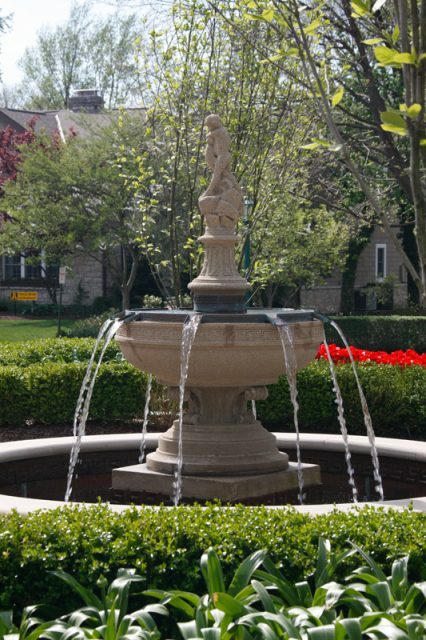 Our designer knew immediately that it could be a beautiful, elegant fountain that would enhance the home’s landscape. 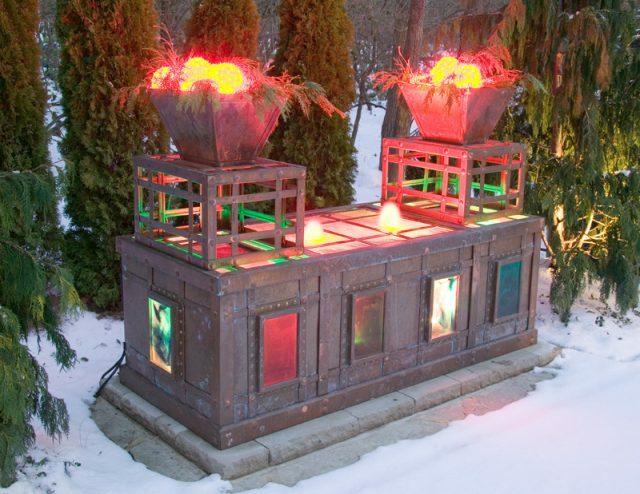 After the piece was cleaned and repaired, a copper pedestal with multiple channels was designed and fabricated. 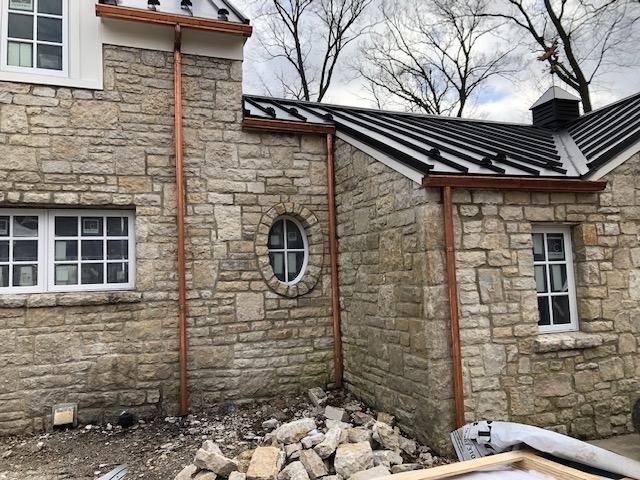 The water capture basin was designed with a Greek keystone design, again in copper, to tie back to the original concrete piece. 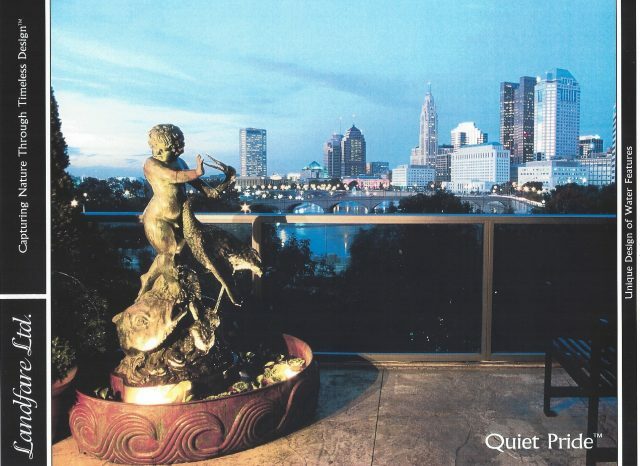 The new prominently placed water feature comes alive day and night, through every season.